Most of this article was copied from www.disneysrobin.blogspot.com – and this is a site well worth a visit - written by a friend of mine Tony who has done this for a number of years and has given me permission to use this – the Blog is all about the film The Story of Robin Hood 1952 Walt Disney – made at Denham Film Studios in England – and beautifully made I have to say !! 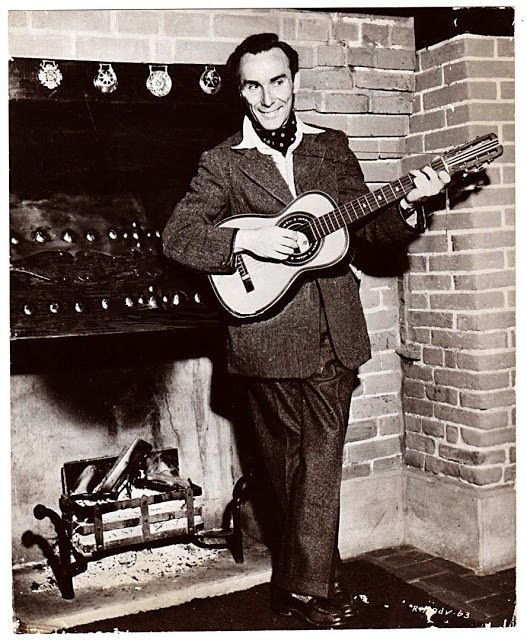 Elton Hayes has been singing to a small guitar ever since he bought a sixpenny ukulele as a school boy. The smooth easy manner in which he sings those old English ballads and folk songs has come with many years of training in the theatre.Elton was born in Bletchley, Buckinghamshire, but spent most of his school days in Leicester. His parents were both in the entertainment business – his father was in the circus and his mother was a singer.It was natural that Elton should want to follow in his parents footsteps. He toured the country with them, and while they performed on stage, he would sit in the wings watching, and learning how show business worked.He soon mastered the sixpenny ukulele which he bought with his pocket money, and by the time he was ten years old he could play nearly every stringed instrument.Elton wanted to be a straight actor. However fate turned his career in other directions. He became interested in old English folk songs and ballads.When the war started in 1939 Elton joined the army and became a gunner in the Royal Artillery. He was posted overseas in India and decided to take his guitar with him. He was also given a commission.While in India he became seriously ill with rheumatic fever. This was a tragedy for Elton. for his fingers began to stiffen.One day he remembered his guitar. He took it from its case and began strumming it. And soon, after many hours of painful effort his fingers grew more supple. He could play again. His courage had brought him through.In 1946 Elton returned to Britain and appeared on In Town Tonight. This was a beginning. For, like thousands of other ex-serviceman, he found that he had to begin building a career again.Just how successful he has been can be judged from the number of programmes he has appeared in on radio and television.He has had a record spot on nearly every major radio station on the Continent and the BBC. He has appeared in his own show on television and was a permanent member of Eric Barker’s Just Fancy. 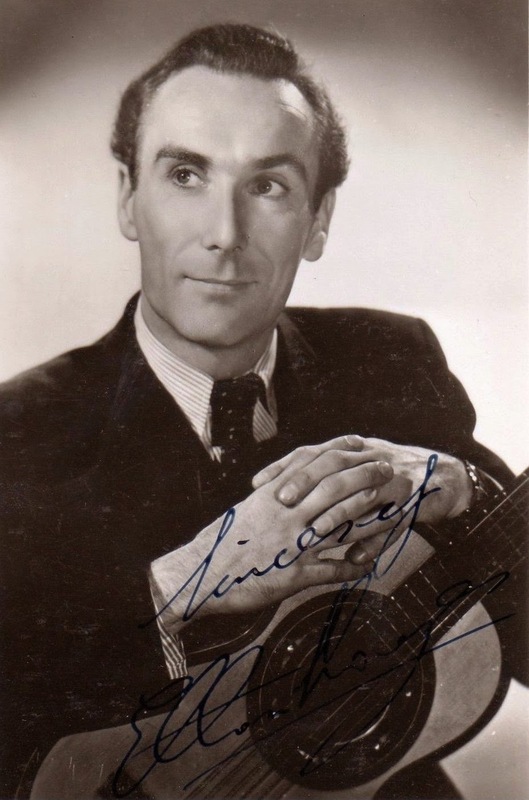 And of course he makes gramophone records.When the film Robin Hood was made in this country, the producers did not have to search far for the man to play the strolling minstrel – Elton Hayes was a natural choice. Elton’s collection of folk songs and ballads is one of the largest in Britain. How does he collect them? By listening, wherever he goes. If he hears someone humming, singing, or whistling a tune which he cannot place, he records it. When he called back he explained: ‘I heard someone in the street, calling- a vendor selling fruit. I’d never heard the call he used before, so I asked him to come in, and we recorded it on my tape recorder. Elton will play back the recording, and adapt it to his style, with words and music. The finished work will be a catchy little song with which he will charm us when he next appears on radio or television. Because his work is connected with history, and the past, it is probably natural that his hobbies should follow a similar path. They are horse mastership, and the old English sport of fishing. Elton is married, and lives in a luxury flat in London. But at the weekends he goes to his 350-year-old cottage in Essex, which he restored from a ruin. It is there he works on the songs he sings to a small guitar. When Elton Hayes came to live at Thorne Lodge I was delighted to meet him. He was a gentleman in every sense of the word, incredibly wise and with a kind but quick sense of humour and bright as a button right up until his death. 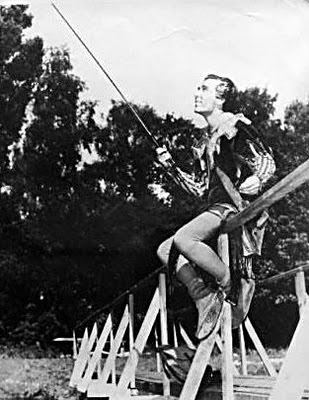 I remember as a child listening to him on the radio singing The Owl and the Pussycat and seeing him as the minstrel Allan-a-Dale in a favourite Robin Hood starring Richard Todd.